The chapter is structured in two parts: the first part presents the agricultural policy of the European Union in accordance with the Treaty of Lisbon and the Europe 2020 Strategy. At the same time, the National Rural Development Program of Romania is presented. 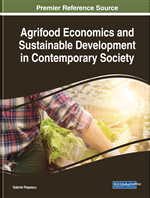 In the second part of the chapter an econometric analysis of the agricultural sector is made. The linear multifactorial regression model presented in the second part of the chapter was based on data provided by Eurostat: surface cultivated with pesticides, GDP/capita, net investment in agriculture. The model proposed in this chapter explains and highlights the existence of a positive, linear, and significant relationship between the variables included in the model. The multiple linear regression model indicates that, with the increase of one million euros per GDP, the value of the surface cultivated with pesticides in Romania will grow by an average of 132.08 hectares. Launched in 1962, the EU's Common Agricultural Policy (CAP) is a partnership between agriculture and society, between Europe and its farmers. Its main objectives are: to increase agricultural productivity, to guarantee the security of food supply at reasonable prices for EU citizens and to ensure a certain standard of living for EU farmers. In the period 2014-2020, the measures taken under this policy would ensure better internet services and quality infrastructure for about 18 million citizens in the rural area, i.e. 6.4% of the total rural population. About half of the lands in the EU are used in agriculture (Agriculture, A Partnership between Europe and Farmers, 2017). That is why agriculture and food production are essential to our economy and society. In the 28-member states, there are about 11 million agricultural farms and approximately 22 million people who work in this segment. In the EU countries, the agricultural and food industry segments provide about 44 million jobs. This common European policy is a must because, in Romania, natural resources are in good condition, but risk management systems and services which the potential climate and sanitary risks can be reduced, are insufficient. Romania also faces difficulties in reaching her socio-economic potential of the agri-food and rural areas. The Treaty of Lisbon does not confer upon the Union additional exclusive prerogatives. However, the new text modifies the way in which the Union exercises its current prerogatives, as well as adopting new ones, encouraging the participation and protection of citizens, creating a new institutional order that modifies the decision-making processes with the purpose of increasing their efficiency and transparency. In this way, it also ensures a higher level of parliamentary control and democratic accountability. Under the Treaty of Lisbon, the European Union has significantly intervened in the field of legislation, food security, environment protection, etc. The European Union’s Common Agricultural Policy has been adopted by all member states (European Commission, 2016). The main goal of this common policy is to introduce several measures and guidelines needed for farmers to fulfill their role in society, namely the production of food people need for a decent living. Therefore, food products must be affordable, of good quality, safe, varied and in sufficient quantities. Also, due to the implementation of the EU’s Common Agricultural Policy (CAP), Europeans can enjoy the benefits of food security.